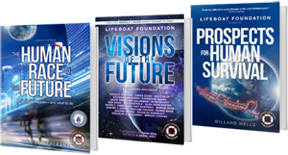 Lifeboat Foundation launches 3 books . The Human Race to the Future: What Could Happen — and What to Do, Third Edition by Daniel Berleant. Read the paperback and Kindle versions. Visions of the Future edited by J. Daniel Batt. Read the paperback and Kindle versions. Prospects for Human Survival by Willard H. Wells. Read the paperback and Kindle versions. Updates about these books will be posted at https://lifeboat.com/ex/books . The Lifeboat Foundation is a nonprofit nongovernmental organization dedicated to encouraging scientific advancements while helping humanity survive existential risks and possible misuse of increasingly powerful technologies, including genetic engineering, nanotechnology, and robotics/AI, as we move towards the Singularity. Learn about the world’s first bitcoin endowment fund at https://lifeboat.com/ex/bitcoin.